Love these! I'm sure you'll get loads of wear out of them. Love them! Can't wait to see them in OOTD's. I've never been a fan of brogues or loafers - I don't think I'm 'cool' enough too pull them off! From the pics you look like you manage it quite well though! Gorgeous loafers! Style AND comfort - what's not to love?! i got a pair from zara quite a while ago, first thought, 'well it is an 'in' thing now,lets see' but wasnt expecting to fall in love with them..how wrong i was! whenever i wear them i feel classy and happy :) definitely a win imo. urs are gorgeous, try to combine them with shorts and a boyfriend shirt! ull love it even more! @ciaramcdonough - i know! i was all over them when I saw the reduction. wouldn't have paid £100 but don't mind paying 70% less! @Onyx - i am sooo glad i snapped them up. the russell and bromley ones are divine as well! I LOVE loafers! They can be so chic and casual! I love how you said you dance MJ in them.. How cute. I know exactly what you mean when you say that you have to wait until you find the perfect pair of shoes that call your name. I'm looking for some oxfords and loafers myself. New to your blog. Lol...your Chung comment made me laugh! I, too, look at things that other people wear and wonder if I can pull them off or not. 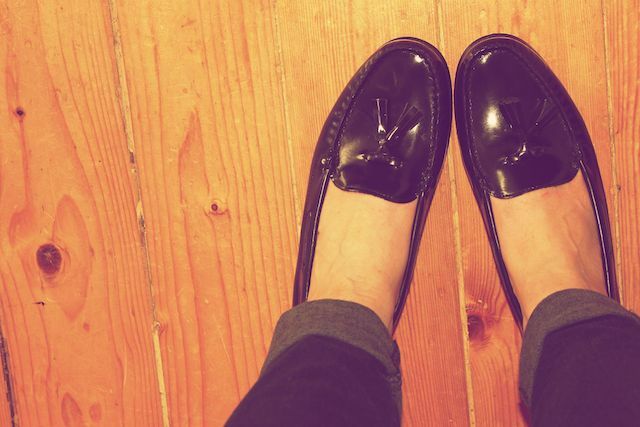 I am loving loafers lately!! I recently found an amazing pair at a charity shop for only $3. But I am struggling with how to wear them and your suggestion of "sexing" them up is very true. I will def be trying that! I want a pair! They would be so cute with an over-sized shirt of some sort. I think I am definitely going to be on the hunt for a cute pair to bad winter is right around the corner. i found a pair of camel colored sam edelman loafers on sale the other day. somehow, i had the strength to hold back. this post makes me wish i had bought them! they're lovely - i might have to invest! Love the shoes, great for any outfit. Can't wait to see your pictures of OOTD and wearing them on. i love loafers! especially in the fall and spring/summer... the ones you got look so chic and simple yet fancy in a way... i love them!! Loafer shoes became popular here few months ago..around Spring..I bought one too but the color is brown and with heels.Now it's summer time here so almost everyone wears flip flops,gladiator sandals etc.. I just couldn't help but notice your watch! where did you get it? I wore loafers to school - dorky I know but it was actually a cool thing to wear since preppy was so highly regarded at the time in my neck of the woods. 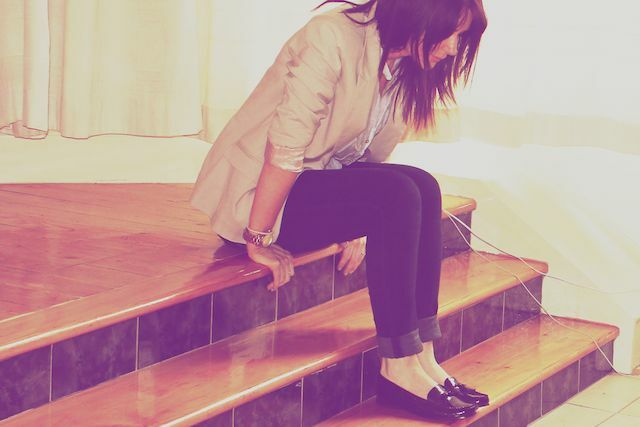 I still love wearing loafers but this time around it's with heels! love them they're so chic, maybe pair them with something super feminine so it all balances out if they reminds you of your dad's shoes a lot. Love these! I can't believe what a bargain they were. I've been dying for a pair of loafers for ages, but every time I try them on I look less preppy and more nerdy -- and not in a geek chic kind of way. They look great on you! I can't bring myself to wear loafers again, I wore them to death in the 90's! I've come round to brogues, but only the heeled ones like the one's I'm wearing in my latest post, I look stupid with flat brogues lol! ahhhh. your blog is dangerous for my wallet. I just bought the grey handbag and then stopped into a shoe store and saw cute/cheap black loafers. Hooray!!!!!!!!!!!!!!! So happy you're back with a new blog! now i have to read all the posts that i've missed! Thank you Laura!!! I saw one from ASOS and am definitely planning on purchasing it! "preppy is fine, plebby is not." haha brilliant! Personally I like them, and I even like them with what you are wearing (not even remotely plebby!) but I do agree with the sexing them up a little plan!